Dubai, UAE; April 29, 2018: Aligning with the spirit of ‘World Day for Safety and Health at Work’ which falls every April 28, the Tristar Group held its annual Global Safety Day event to create awareness on truck driver safety and daily safety practices at work. The event was celebrated across Tristar’s offices in various countries including the UAE, Oman, Kuwait, Qatar, Central African Republic, Kenya, Somalia, South Sudan, Tanzania, Pakistan, and Guam. At its Jebel Ali head office in Dubai, employees, customers and partners gathered for insightful lectures on road safety and health at work, presented by Tristar’s senior managers and representatives from ECOLAB, and WABCO vehicle control system. The speakers reiterated that road and industrial accidents are preventable if all members of the organization adhere to safety principles at heart and mind and make safe practices part of their day to day living. The theme for this year was ‘Safety isn’t a slogan, it’s a way of life’. 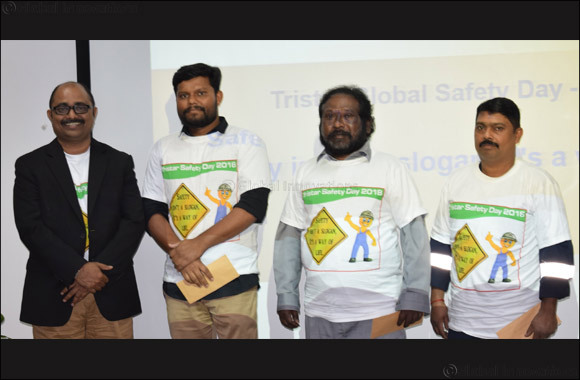 Three Tristar personnel were given monetary rewards by Shivananda Baikady, GM of the Road Transport and Warehousing business for being safety champions in their respective departments. One was awarded for being a safe driver and the other two recipients for adhering to safety practices as a warehouse supervisor and workshop AC technician.